In rare cases, the program may not record voice calls on some phone models. This is due to their hardware and software features that deviate from Android specifications. If your mobile device doesn’t record any sound you should open the userpanel (my.snoopza.com) and click "Settings" button. In the settings list you will find a “Calls” tab. 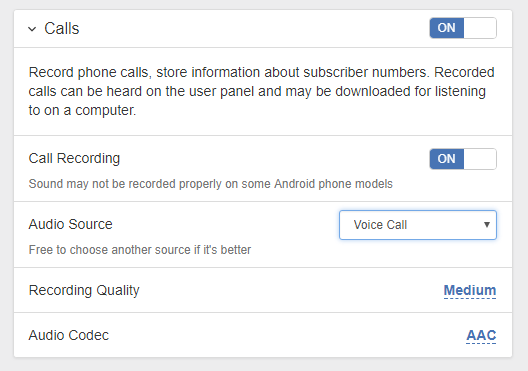 Click on it and enable "Call Recording" option. After that you will see an “Audio Source” tab, which you can change by clicking on a drop-down list. One of the available audio sources will allow the making of high-quality sound recording for the majority of mobile phone models. If call recording doesn't function properly on your device, please contact our technical support with the exact model of your device and the version of its operating system.